Download the Skip intro fix. Copy all the files to <path-to-game>\DataPC\C\Movies\2997\, overwriting the exisiting files. Very limited support. See Widescreen resolution. Off by default. Can be forced through the graphics card control panel. Download Cars Mater National Resolutions. Copy the content of the <your resolution> folder to the installation folder. Run the game and set 800x600 resolution. Information for creating custom resolutions are included in Readme.txt. Knowledge of hex editing is required. Modify the various FOV values. Modified files can be downloaded from the Cars Mater National Resolutions fix. 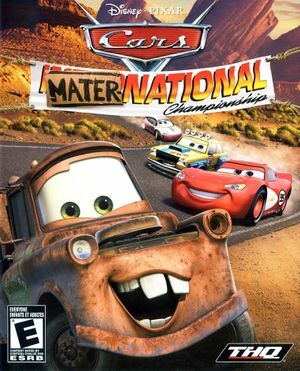 Mod for Cars: Mater-National Championship that aims to combine the best elements of Cars, Cars Mater-National Championship, and Cars Race-O-Rama into one complete package. ↑ 1.0 1.1 File/folder structure within this directory reflects the path(s) listed for Windows and/or Steam game data (use Wine regedit to access Windows registry paths). Games with Steam Cloud support may store data in ~/.steam/steam/userdata/<user-id>/332260/ in addition to or instead of this directory. The app ID (332260) may differ in some cases. Treat backslashes as forward slashes. See the glossary page for details.